Description	 MS in Greek on papyrus, Egypt, late 3rd - 2nd c. BC, 3 fragments from column 1-3 of a scroll, 8x4 cm, 13x9 cm, and 6x8 cm, (original column width ca. 16 cm), 32 lines in Greek uncial. 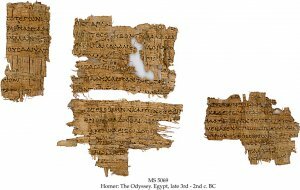 Context	 Roger Pack (The Greek and Latin literary texts from Greco-Roman Egypt, 1967) records only 7 MS papyrus fragments from Odyssey book 12, none as early as the present MS .
Provenance	 1. Private collection, Switzerland (1965-1999). Homer's poems were originally composed orally in the 8th c. BC, and transmitted orally until written down in many different versions several centuries later. The first critical editions were made by the Alexandrian scholars, Zenodotus (325-234 BC), Aristophanes, Librarian of Bibliotheca Alexandrina (195-180 BC), but foremost Aristarchus, Librarian of Bibliotheca Alexandrina (180 - ca. 145 or 131 BC), who published his definite edition in the middle of 2nd c. BC, which is still the standard. The very few surviving Homeric papyri that date from before Aristarchus' edition, are of the greatest textual importance, since they alone preserve the earlier forms of the poems, as they were recited by singers in the archaic and classical periods. The present MS is the earliest of book 12, and the only one from the pre-Aristarchan period. It has alternate versions of some lines, and there are no less than 8 additional lines not recorded in any MS. This earliest preserved version of the story of Kirke, is about 30 % longer than the standard version. There is a possibility that the present MS also reflects Aristophanes' recension. In that case it would most likely have been copied in Bibliotheca Alexandrina. Homer is represented in The Schøyen Collection by MS 112/33, The Iliad XV:511-515, ca. 100, MS 112/57, The Iliad II:195-197, 2nd c., MS 112/80, The Iliad XI: 1-5, 2nd c. (the earliest witness to the text and not otherwise extant on papyrus); MS 2628, The Iliad XVI:2-15. 32-37, 40-43, 47-61, 75-91, 1st c. BC-1st c. AD; MS 5094, Homer: The Iliad XVII:637-644, 679-685, + 1 extra and 1 new line (earliest witness to text), 3rd c. BC; MS 5069, The Odyssey XII: 9 - 14; 17 - 28; 41 - 46, late 3rd -2nd c. BC (earliest witness to text); and MS 2629, The Odyssey XI:509-603, ca. 1st c.
Papyrologica Florentina, vol. XXXV. Rosario Pintaudi: Papyri Graecae Schøyen. Firenze, Edizioni Gonnelli, 2005 (Manuscripts in The Schøyen Collection V: Greek papyri, vol. I), pp. 19-25.